Pittsfield, Vermont, a wonderfully small town that serves as the proving grounds to mold and define both men and women, is the home of one of the most challenging events on the planet, The Death Race. What started in 2005 with just eight competitors has grown today to become a tri-annual gathering of athletes, former military, and adventure seekers from all over the globe. 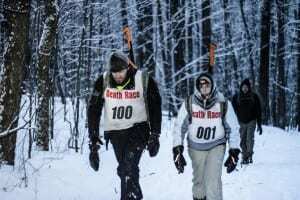 Unlike the Summer event, which had 344 registered and approximately 260 starting racers, the Winter Death Race– a more demanding and challenging event given the cold and snow – counted only 84 registrations, and a mere 58 arrived at the starting line to brave the elements. They may not have known whether they were ready; but they had the courage to show up at Amee Farm and that is half the battle. By the nature of its definition, a race typically has a defined start and finish. What you do in the race is usually a clear individual activity or series of activities. In a triathlon, you know you’ll be swimming, cycling, and running. Even most mud runs and obstacle races present their participants with a map and/or a listing of everything they’ll encounter along the way. The Death Race is different because racers participate for an undetermined amount of time and have no idea what activities they must complete. Typical obstacles include running, chopping wood, carrying awkward and heavy objects, dealing with mental mind games and solving puzzles. Furthermore, they must be prepared with enough food and water to keep them going for up to 48 hours. In 2012, participants clocked 36 hours before the winner was declared. The 2013 Winter Death Race trumped it, lasting just over 39 hours. 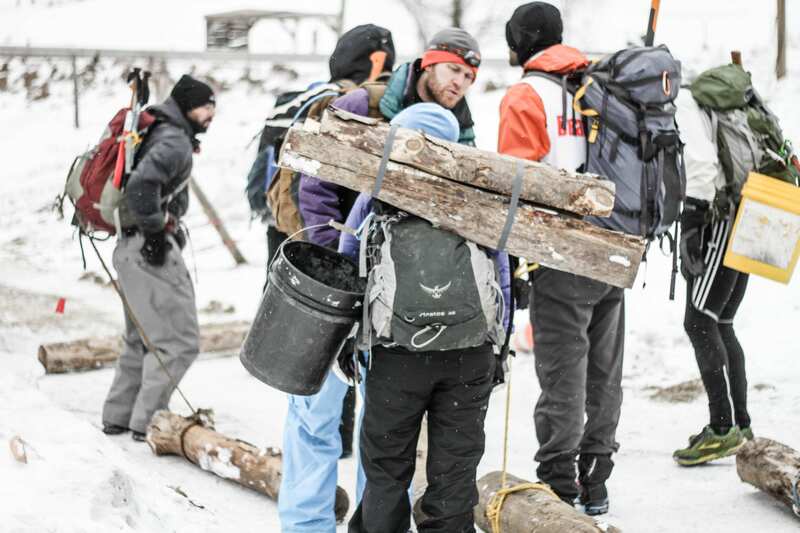 The Winter Death Race is a testament not only to the participants’ ability to stay awake but also their ability to perform beyond any reasonably comprehensible limit. 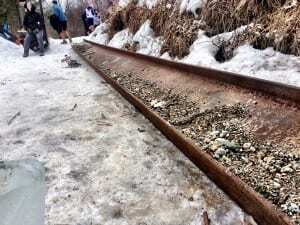 This past February, the temperatures plunged as low as sub-25 degrees, and a thick layer of ice and snow covered the mountain and connecting trails. In the end, 11 brave souls had the guts and tenacity to withstand the trickery, the subzero temps, and the madness relentlessly thrown at them from Joe DeSena and Andy Weinberg, cofounders of the Death Race and Spartan Race. In the Death Race, traditional rules like a starting gun are thrown out the window. The race “begins” and athletes go full-throttle for hours before the race clock actually begins counting the minutes. The actual time elapsed and the amount of time the race clock will show elapsed have been different every time but in the end the total amount of time doesn’t really matter. This is the Death Race and it ends when Joe and Andy say it ends. And this is how it begins: Joe or Andy will have everyone start on tasks and chores around the farm. Those tasks started off with the usual wood hacking, chopping and splitting. An axe has become a standard item on the required gear list, and there’s always plenty of wood smashing at both the Summer and Winter events. Afterward, racers went on a short run over to Joe’s barn where they each were filmed doing their favorite exercise for Maxim magazine’s website. Meanwhile, as each individual was filming, the rest of the racers were in the basement of Joe’s barn subjected to nonstop physical training. Squats, burpees, sit-ups, pushups, burpees, and planks, the punishment continued relentlessly for three to four hours. A dynamic took shape during this section—all the bodies in the room were moving up and down like ocean waves at different speeds, and the peaks and valleys varied like bobbing boats. Certain athletes were clearly trying to conserve energy reserves. One participant, Carmen Caruana, 32, from Long Beach, NY, stood out because of her speedy, impressive squats. The depth of her squats consistently remained below 90°, and her knees never broke the plane of her toes. The whole room had their eyes on her, sweat dripping down her face while she moved robotically up and down continuously. She was the first to finish squatting 1,200 times. Then the group was divided. The half who still hadn’t filmed were required to perform another 1,200 squats and more physical training. The other half were sent back to the barn to complete more farm chores, chop wood, and clean animal dung out of a barn. Teams of four or five worked together to haul enormous hay bales approximately a half a mile without rolling them. From the barn, racers had to return to Amee Farm by crossing a bridge; This was not just any bridge, it was a rope bridge built by Don Devaney and Norm Koch, both of whom work for Spartan Race and help with race directing when Joe and Andy are not around, and Johnny Waite, three-time Death Racer with two finishes and one DNF (did not finish). The bridge looked like an upside-down rope triangle– two ropes for your arms and one for your feet. It replaced the old I-beam bridge that existed here as recently as last summer but was now submerged in the riverbed.. The technique to cross quickly involves generating a bounce between the hand ropes and the single rope for your feet. Simple for some, but it was clearly scary for others because beneath it flowed a rapid ice-cold river, and it would not make for a pleasant evening if someone fell in. When someone crossed slowly, it would create tension that would make it even more difficult for the people behind. In what is assumed to be an effort to confuse and disorient the racers, the directors played a few mind games involving the race clock. After hours had passed, racers were notified that a countdown clock was started; and they had four hours to finish the next set of tasks. Once the four hours were up, the clock was reset and began counting how many hours had elapsed, they were notified after already competing for over 12 hours that the race had begun. This was just another way for the race directors to get inside the racers’ heads. Afterwards, they were sent on a hike up Joe’s mountain. Racers were divided into teams of 15 or so and tied together during one of their many forays up the mountain. The hiking up and down continued through the cold, dark predawn hours. First back from the last hike was, of course, Amelia Boone, who placed first female the year before in the Winter Death Race. She looked very upbeat for having just spent the past 15 hours doing rigorous physical training, farm chores, heavy lifting, and hiking. The countdown clock still had a few minutes left by the time everyone made it back to Amee Farm. Those who came in fastest had more time to recoup and refuel. Now that a new day had begun, the race clock was officially started; and with it, the race had begun. After sunrise, participants moved down to the river, where the next set of challenges began. Most of the racers looked surprisingly fresh given how much they had already endured. As the racers faced the river and realized they would spend much of the morning and afternoon in the cold water, you could see the fear begin to make their attempts at remaining positive fade. Their first task was to retrieve a 2,600lb I-beam from the bottom of the riverbed. Easier said then done. First they had to break apart an island of ice that had formed over one end of it. Then racers rotated in and out of the water working to remove the sludge on the bottom that buried the beam. Those on shore attempted to hoist the beam out of the river with a rope they had affixed to the beam. It soon became evident that the water would be THE determining factor in who would finish and who would not. Joe and Andy would level the playing field down to their desired 10% finishing rate by relying on the harsh reality that most people are not willing to lose toes for the sake of a race. The plan worked brilliantly. While the racers worked to free the beam, one after another, the cold defeated the racers. Suddenly, multiple racers needed help out of the water, and a few had to be taken back to Amee Farm to stop their body temperature from dropping too low. Many of the drops were necessary and some even forced by the race director (better known as a medical drop). In spite of this, some still desired to stay in the race; but it was in their best interest to walk away and save themselves from permanent damage that could prevent them from ever returning to the battlegrounds. Todd Sedlak, a former Winter and Summer Death Race finisher and local to the area, was forced to drop out and volunteered to provide medical support because racers were dropping faster than the crew and volunteers could manage. Astonishingly the remaining racers succeeded, and the beam lay on the shore looking freshly plucked from the bottom of a riverbed. It was a true testament to the incredible ability a human collective has when working together as a team. After their success, they did not have much time to recharge and heat themselves back up. In true Death Race tradition, they were sent straight back to the river. The racers were instructed to cross the rope bridge again, perform 100 burpees on the riverbank, wade back through the water, receive a Sharpie tally on their foreheads, and then repeat this cycle ten times. These racers did not give up without a fight, but even the best of the competitors began to break at this point. They had been in this race now for almost 24 hours. Eventually those who persevered the frigid waters and hypothermia moved on and the rest either med dropped or choose to pull themselves. Amelia Boone, for one, found her limit and voluntarily chose to DNF. The river sliced the number of participants in half and suddenly there were fewer than 25 people standing. Up until this point, nothing specific set anyone apart—it was still anyone’s race. Saturday evening had arrived and the sun fell beneath the horizon. The next challenge began almost immediately. The remaining few dozen racers were to each carry, drag, or haul a three-and-a-half foot log up to the top of Joe’s mountain next to his cabin. Then, racers began to be slow down because each had been assigned a series of tasks at the top of the mountain that began with building a snow mound about a foot-and-half tall using their right shoe, knocking it down, and then rebuilding it with the left shoe. Next up were six tangram puzzles to solve. These consisted of seven flat shapes, called tans, which are put together to form shapes. The objective of the puzzle is to form specific shapes based on the silhouettes on the cards given. This would create a bottleneck for the race because only two sets of puzzles were available. Waiting around in the chill caused muscles to tighten and cramp. 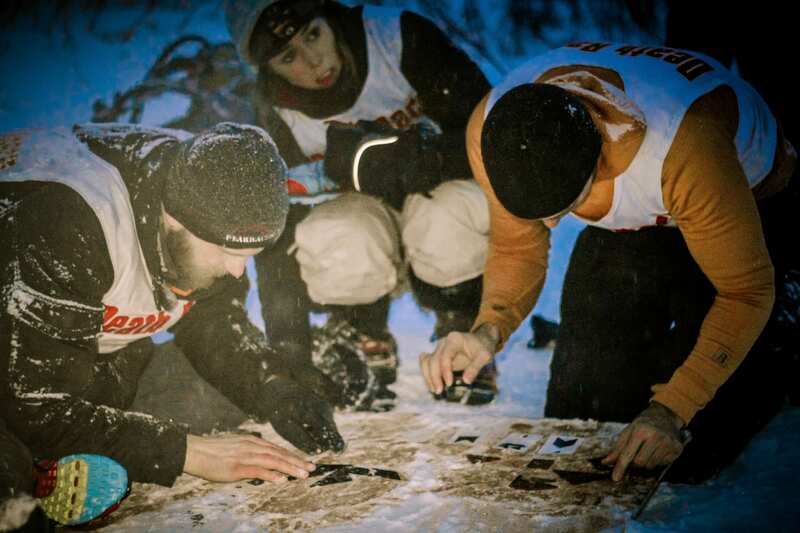 To make solving the puzzles even more of a challenge, it began to snow; night had fallen, and the racers were prohibited from using their own headlamps for a light source. Finally, once that task was accomplished, racers had to return to Amee Farm, and then another rotation would begin again. 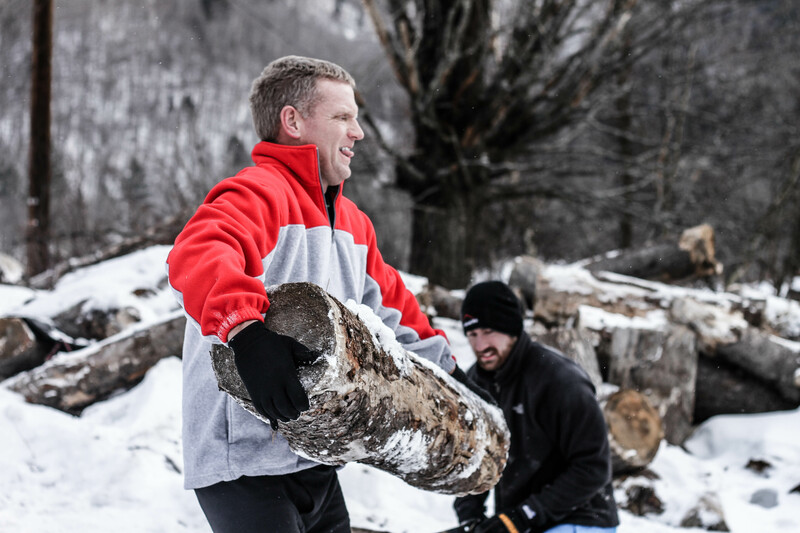 Carry a log to the top, build the snow mounds, solve the puzzles, and repeat. Each lap took about two to three hours, and racers had until 5:30am to complete three laps. Throughout the race, one thing was commonly seen: racers helping one another with everything. Even here they assisted each other in solving each new set of tangrams. During her third lap, Nele Schulze arrived at the top of the mountain and found she was alone. Shocked, she asked where everyone was, only to discover that she had just become the leader of the entire race. She was in first place overall. Soon after, Olof Dallner and Joshua Grant arrived by her side. The downhill on the third lap became a thrilling event for the last seven who still officially remained in the race. Seven or eight others were still on the mountain completing their second laps. It was almost 4 a.m.; they had no chance of completing a third lap. Up until the last mile and a half, Joshua and Olof had taken the lead and decided to run in together because they had worked as a team often on this challenge. The honorable teamwork and comfort soon ended when they heard the sounds of other racers approaching. Instantaneously, the heat was on. The pair finished their all-out sprint together, followed in order by Jeff Foster, Souvalion Andranik, Mark Webb, Nele Schulze, and Melody Hazi. From the group of two-lap finishers, four were determined to see the race through till the end and refused to stop following on to the next challenge. At 5:30 a.m. the remaining racers met outside a yoga studio for what was said to be the start of a 20-mile hike through Bloodroot Mountain Trail. 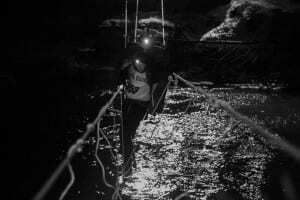 These trails were known to have difficult access in the previous summer race, a Death Racer with a knee injury had to wait six hours to be rescued and that was in ideal conditions. Getting someone out of there in the snow could very well lead to death. But with more than 38 hours in, and despite the grim reality of the terrain, 11 racers insisted on doing whatever it took to continue on. It was a beautiful moment for everyone to earn his or her skulls. It’s amazing how much pain, suffering, and impressive human feats these athletes endured at the Death Race for the prize of a plastic skull. It symbolized more than any finisher can ever describe in one sitting. It’s a lifetime of new insight on life, because the Death Race changes you—whether you are a volunteer, a finisher or the dreaded DNF. After showing up to witness or participate in a Death Race, you realize how alive and well the goodness of the human spirit is in everyone involved. The people who come out here year after year to witness the race, to help their racers and just assist wherever they have enormous hearts. When racers began to drop out due to medical issues, it was reassuring to see how fast and willing strangers were to help each other, even if it meant putting some random racer’s feet up their shirt, using the warmth of their chest to prevent frostbite from setting in. There should be an awards ceremony for every one of the people that put up with all the madness this Death Race creates. It does not matter what role you play. Once the games of the Death Race begin all involved soon discover that they too could be used in molding the outcome. Volunteers could be told to try to get racers to quit, false information might be told to support crews, whether or not you are racing, you are could become part of the race, even if you don’t know it. These people are what make this event work and help create such a remarkable experience. The big question that presents itself over and over whenever the topic of the Death Race comes up is why would someone do this? Why would someone pay to do farm chores? Why would someone stay up for two days straight living off of mostly protein bars, water, and whatever hot soups they brought with in a thermos, enduring physical labor, chopping wood, and all the mental gymnastics? After asking everyone this question there was a variety of answers but most commonly was for the life altering experience. It’s the realization on how much we, human beings, are capable of with so few necessities. Being able to push yourself to limits you never knew could be reached. It’s an incredible atmosphere to be around. If you are even the least bit curious about what the Death Race is about then get yourself a ticket to Pittsfield, hop in your car and volunteer at the minimum and experience what is the brilliant madness of the Death Race. 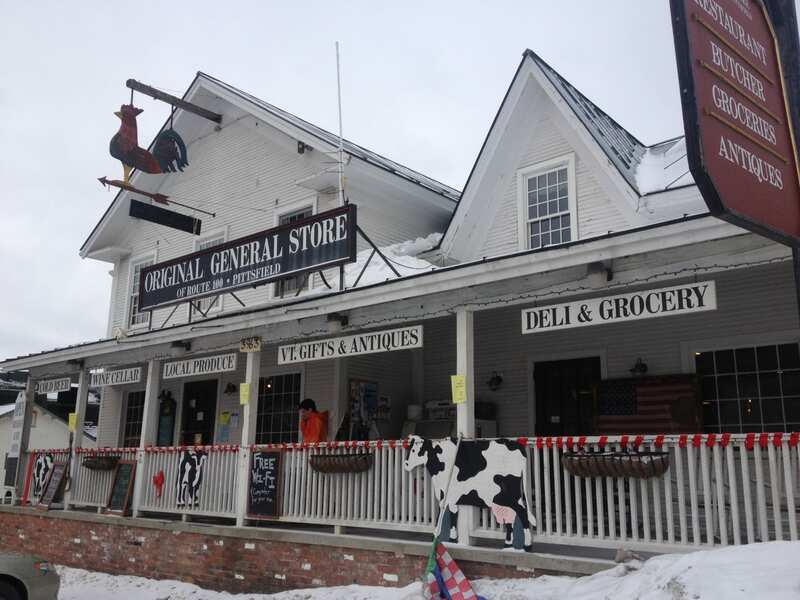 I’ll see you at the General Store. This year a crew will be filming a documentary on the Winter Death Race. 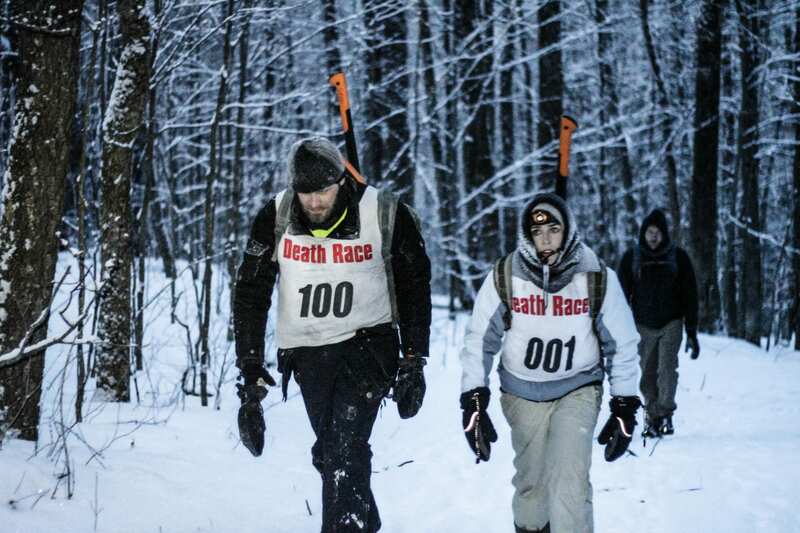 Visit the 2014 Winter Death Race Documentary Facebook page for updates. Anthony Matesi is an athlete, entrepreneur and social marketing professional. He has competed twice in the Spartan Death Race with one finish under his belt, placed 3rd at the San Diego Alpha Warrior and is the author of the Legend of the Death Race. You’ll find him traveling the country racing in the Spartan Race circuit, directing the Spartan Hurricane Heats and HH12HR as well as coaching Spartan SGX at the new gym he helped open, REACH, located in Chicago, IL. Thank you, Anthony. Great Recap (as I respond more than 2 1/2 years after the race). This was a great race. I wish I would have listened to just myself and stayed in it, instead of letting somebody tell me to drop, but such is life. The racers were awesome and the volunteers were amazing! I think about this day often and still can’t believe that I was even there. This was truly a one of a kind moment, and I hope to one day be able to participate in something like this again.